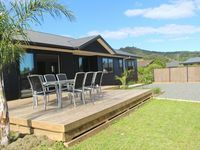 Properties in Long Bay average 4.6 out of 5 stars. Property 5: "Sky House" Amazing Views and luxurious. Best place to stay!! Property 11: Poppy Apartments ~ Stunning Views! Property 12: Waterfront Vista in Wyuna Bay. Property 17: A hop, skip and jump from the door into the water! Property 23: Cute Colville Farm House - be active or RELAX !! Property 25: Stylish and Peaceful Heritage Listed Cottage - 4 bedrooms & 2 bathrooms. 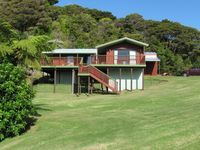 Property 39: Bay Watch ~ Wyuna Bay ~ Stunning Harbour Views! Property 49: Fisherman/Family/Friends - Close to Beach & Township. WIFI and Sky TV.